Bought this projector as our family love films. The initial setup wasn't ideal, using a Roku 4k streaming stick and an analogue amplifier for audio. The Roku HD content would stutter, making the viewing difficult and bringing on motion sickness. Switched the source to a raspberry pi kodi setup. Much better and HD content was great. Finally upgraded to UHD Bluray. This is by far the best option. Action is nice and smooth and together with a screen the 90” screen beats all UHD TVs. Just need to upgrade the audio for the ultimate in home cinema. Setup is pretty straightforward with HDMI and options for flipping the image around. The sound of the fan can be a bit annoying when there are quiet scenes. Overall a great projector for UHD for the price. After owning the Optoma UHD550X for over a year and needed something a little smaller for my cinema room. 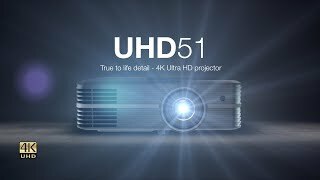 I heard so many good reviews about the Optoma UHD51 and becusae ive always had Optoma projectors i decided to go for the 51. The projector arrived well packed from Amazon. Slick black case with an off set lens it really looked the part ! Connected to my uhd player and fiddled with the settings and got a gorgeous picture. The Reverent in 4k looked amazing it was like looking though a window i could of actually climbed though haha. The depth of the film was incredible so much more the LCD and what you get for the money is simply amazing Optoma really listen to there customers. So happy about this product thanks again Optoma you made my Christmas ! !